Lynn Ritchie does it again this fall with another collection of sophisticated designs and bold prints. Lynn Ritchie sent me this outfit to review. All opinions are all my own as always. This cold shoulder top is made of viscose and rayon stretch crepe, such a pretty fabric and the perfect weight for early fall. It has a mock turtleneck with cold shoulder cut-outs that can easily be worn with a regular bra. And the top is tunic length which is always versatile. 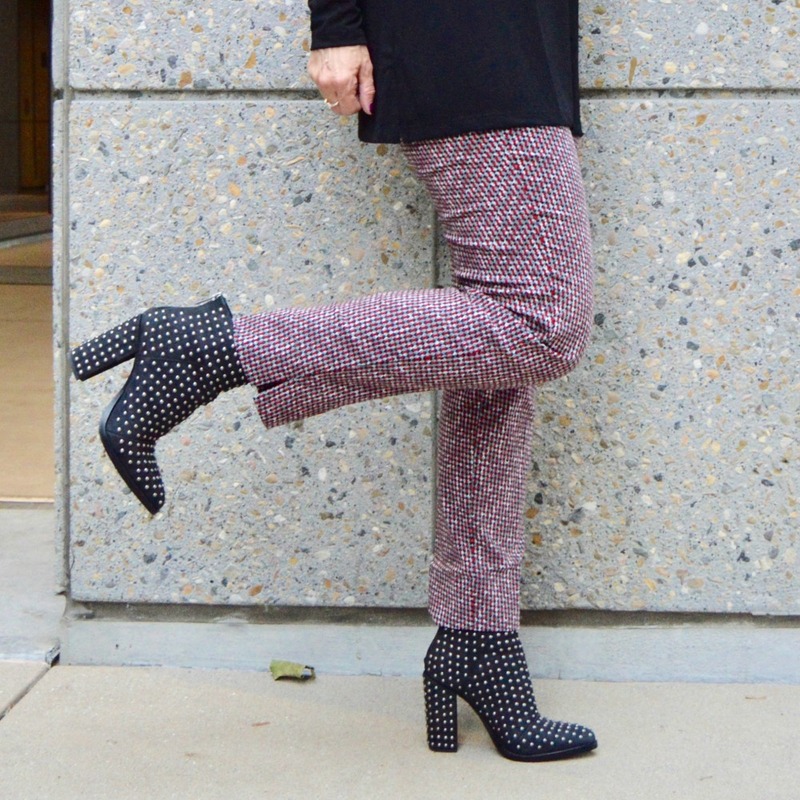 I don’t usually think of a print or pattern when I think of slimming pants, but I couldn’t say no to this cool graphic black, white, gray and red print. And they really are slimming! Made of nylon, rayon, and spandex, they hold their shape and feel comfortable. And very best of all, they have a slimming panel in the tummy/muffin-top areas. As I age and my body changes, this little trick is getting to be a favorite of mine! With my fab new Lynn Ritchie pieces, I’m wearing my funky new boots from the Nordstrom Anniversary Sale. They’re sold out, but fingers crossed they come back in stock because … well duh, they’re fabulous! (ETA: Back in stock!!) I’m also wearing Illesteva sunglasses, silver hoop earrings, and carrying an old red tote (love this pretty option). As always, every piece of Lynn Ritchie clothing is high quality, well-made, and versatile. I plan on wearing this tunic with other pants and skirts and even with some funky raw edge jeans. 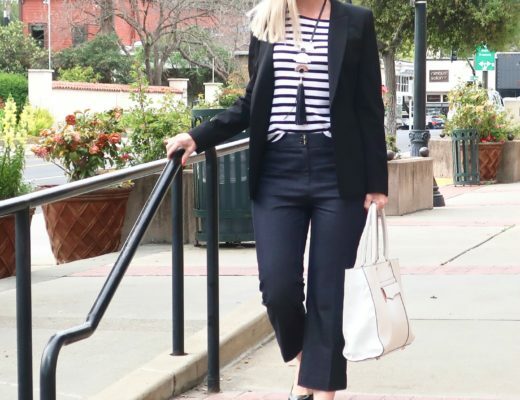 And the pants can be worn with a casual t-shirt and loafers or dressed up for work with a blouse and jacket. 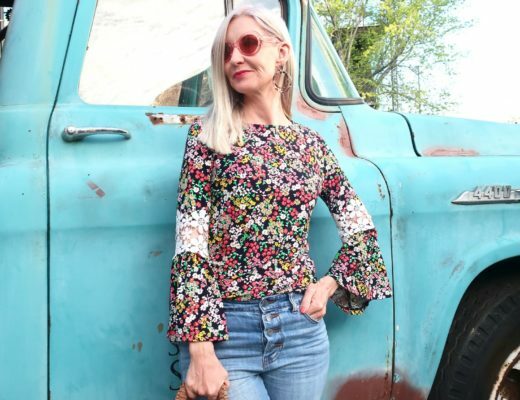 I thought it would be fun to wear these flattering print pants for a date night out, so I added an off-the-shoulder top and some strappy sandals (option), along with my Rebecca Minkoff cross-body bag. Be sure to check out all of Lynn Ritchie’s fabulous new fall collection! 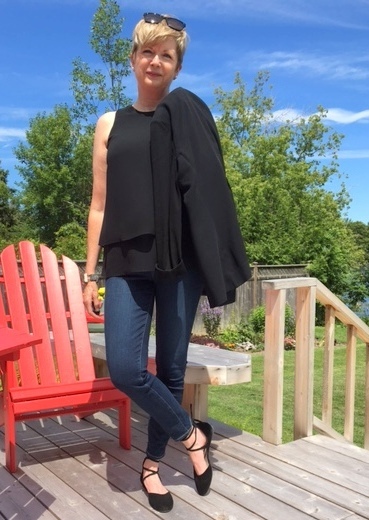 For my pick from last week’s link up, I’m going with Susan of High Heels in the Wilderness! 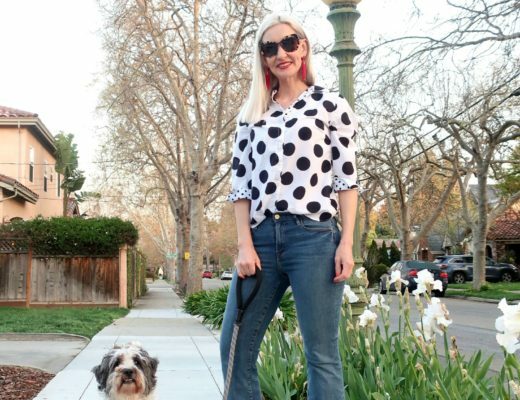 Not only does she look great, her “The Death of Skinny Jeans” blog post made me laugh out loud! It’s been a super busy first week of school for this teacher, Dolls. I’m really looking forward to relaxing a bit this weekend with a nice cup of coffee and checking out your latest posts! Thanks for featuring my post, Dawn Lucy. Love that it made you laugh! Also love those print pants with your new boots and that black tunic. Dawn Lucy, those pants are crazy fabulous! And the pairing with the fantastic booties is simply spectacular! Both looks are stellar! Thanks for the link up and good luck with the new school year! Love the top and the peek a boo shoulder. Those boots, rock! Fab look Dawn Loveee those boots! That second look is so gorgeous. Love the off the shoulder top and those shoes are amazing! 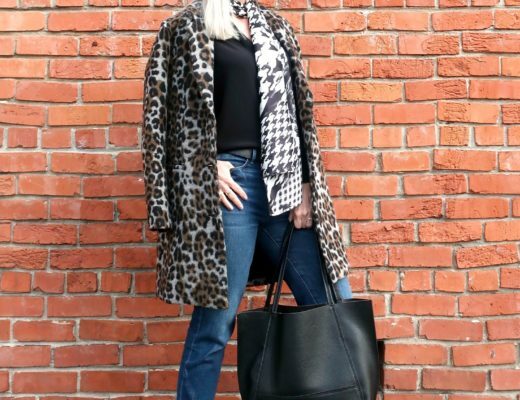 You look fantastic in both of these outfits, so chic and perfect for fall! Thanks for hosting each week Dawn Lucy! Fabulous pants! I love them with the cold shoulder top and the fabulous boots. And they look also fantastic with the OTS top and the strappy sandals. I hope your first week back went well! Have a wonderful, relaxing weekend! Cute outfit Dawn! Love how you styled all those pieces!! Girl—you are rocking this look!! You have an amazing sense of style which clearly shows in your choice of boots as well as the second “dressier” option for the pants. Thanks for sharing that genius and for hosting. I hope you have a lovely weekend. This is such a fabulous look! I love those booties! So many gorgeous shoes!! This makes me want to go shopping! That looks like a different print! Love the way you styled it with black! Love how these pieces look together! Plus, the booties are super cool! Thanks for hosting and have a great weekend! The Nordstrom Anniversary Sale! They’re out of stock right now, but hopefully they’ll come back in stock soon. So cute!! I hope you had a good first week! Thank for sharing this line! I love you top and those studded booties are fab. Thanks for the link up! Cute line, Dawn! Thanks for sharing and for the link up! Such a fun print! You look lovely as always! Love those boots and the print on the pants is super pretty! 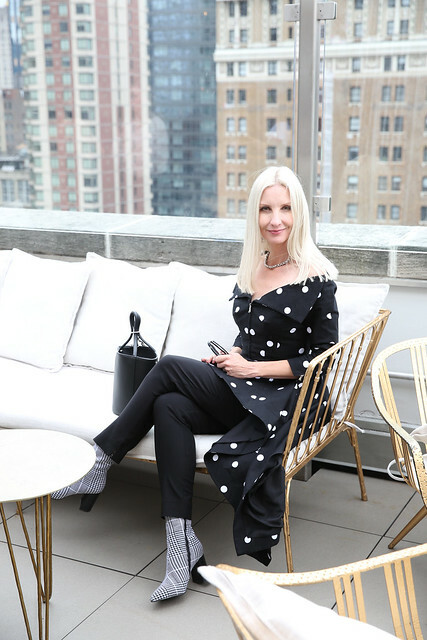 Great post and I love the high style of your shoes and pants! So fun! Peace! I was not familiar with Lynn Ritchie until now. Love the OTS top on you! Thanks for the linkup! Love that chic outfit! You look amazing! Both outfits look fab! I love the OTS top and those boots are gorgeous! What a fun pair of slacks. You’ve inspired me to pull out my one pair of printed slacks. Oh wait! I have a camo pair as well. Two pairs. Two pairs of interesting pants in my closet. I should go wear them! 😉 Love the booties as well!! Thank you for hosting, Dawn Lucy. Cuteness overload!!!! And those booties!! !